The memories, naturally, are still painfully raw for Justine Mitchell. In the space of three days in 2008, she lost her husband Ken and her father, the Dundee United owner Eddie Thompson. "I don't know," she says quietly about how she coped. Ken Mitchell died in a motorbike accident while the family were travelling up to Dundee to visit Eddie Thompson in hospital to say a final goodbye. Justine Mitchell saw her husband's crash in the rearview mirror of her car. "That's quite ironic, because he used to always tell me that I should use my rearview mirror more," she says. "I did that day and saw the whole thing. He died instantly. Then my dad died three days later from cancer." She is a slight figure, self-composed and engaging, open company. She has told the story before, but it is relevant still for the insight into her character and nature. Mitchell doesn't seek a public profile and has not carried out many interviews, but she is taking an increasingly involved role at Dundee United, where she is a director and co-owner with her brother Stephen Thompson, the chairman. The club is wrapped up in every aspect of her life, and has been for as long as she can remember. After the accident and then her father's death, she could not return to Tannadice for more than a year. The club is central again to her life, along with raising her son Monty, and a spa in Edinburgh she established with her friend Jill Kinsella, who was Ken's first wife. The story, by any measure, is heartbreaking but also testament to the human spirit. "Ken that morning decided he wanted to take his motorbike, which I never wanted him to have in the first place," Mitchell says. "Just before the Forth Road Bridge, about half past eight on a Sunday morning, he came off the bike, he lost control. "You just do [find a way to cope]. I had to get up for Monty every morning. I can honestly say I don't know where I'd be if I hadn't had Monty. He couldn't walk, he couldn't talk, we'd just celebrated his first birthday the month before up at Tannadice. "I had nightmares, saw Ken all the time coming off his bike. Ken's death just took over. It's different because I was really close to Dad and had to sit with him to talk about his funeral arrangements. It was just horrific, but I knew it was coming. "With Ken, it was just so out of the blue and that was what took over, my grief for him. It's all a blur. I had two funerals in two days. I have to be honest, I don't remember a lot at all. "I grew up [at Tannadice], I'd been going since I was 14 and I love the club. I had all the memories with my dad, then Ken used to come with me, and Monty's been going since he was three weeks old, so my whole life has revolved around United. All those memories - I couldn't go back, I couldn't bear it." She is now a key figure at the club, an involvement that is hugely important to her, but for its own sake rather than emotional reasons. Mitchell was a lawyer before moving into property development with Ken. After the property market crash, she looked for a fresh start and began her own business, which is now thriving. She found a way to cope, forming a close bond with Kinsella which provides an important link for her son and her step-daughter, Jessica. "After Dad and Ken died, I didn't have much support from my family and that was obviously because Stephen had to step in straight away to look after the football club, and that is 24/7, and Mum was grieving for her husband," Mitchell says. "Jill's family was up north and her daughter had just lost her dad. We pulled together." Out of that relationship came a business plan, too. All of the character traits - the determination to succeed, the business instincts, the drive, the savvy - are shared with those that shaped her father. That relationship was central to Mitchell, and her relationship with United. "People say I'm very like my dad. Dad gave me a lot of confidence and I'm a confident person, although if you met me seven years ago you wouldn't recognise me," Mitchell says. "You'd find me on the floor crying, literally, and setting up the spa has given me so much confidence to see us bringing in clients and them coming back, and it being successful and winning awards. "Dad taught me a lot. Some things that stick with me are you've got to make things happen, it doesn't just happen for you or land in your lap, and the other major thing was go with your gut." Dundee United were a huge influence in her life. It was a passion and routine she shared with her father and brother, and latterly her mother also. There were good times on the pitch, but the enduring sense is of the emotional bonds that were able to thrive at the same time. "I grew up in a house where my brother Stephen was going with my dad all the time to the football and when we won the league it was great celebrations and I just thought, I want a piece of that," she says. "So I started going with my dad and then I got my first half-season ticket book that Christmas - that was me absolutely hooked. Home and away, I went to every single game with Dad. "We used to make up lunch on the mornings of away games, rolls, and Dad would do his flask of tea. Off we would go in the car and we'd sit outside the ground and open up our lunch. It was great times, especially going with my dad and my brother. "I was really lucky, I went over with the team to Barcelona [in 1987] - my dad had become the commercial director at that point. We obviously won 2-1, John Clark and [Iain] Ferguson scored and it was just crazy. "For us to beat them was amazing. I nearly got suspended from school on the way back because I was on study leave and I was caught on camera on BBC Scotland coming back with the team. So that didn't go down too well." Mitchell was at home with her parents when her dad received the phone call in 2002 from Jim McLean to say that the club was for sale. It had long been his ambition to own United, but despite the family's long-held allegiances, there were reservations. "I loved my dad dearly, we were very, very close," Mitchell says. "But one thing about Dad, if he wanted something he made sure he got it. He was determined to buy the club and none of us wanted him to buy it, the whole family. "It was because of the stress and strain that goes with running a football club and the money that goes into it. We just knew it wasn't going to be an easy ride, for the family or Dad. "Don't get me wrong, I love the club and I feel massively privileged to be involved and I would not change it for the world. But at that point in time it didn't feel right for the family. "It's funny, because Dad was a massively successful businessman who thought with his head, but when it came to the football club, like a lot of people he thought with his heart sometimes, maybe too often. But his heart was always in the right place." Strong-willed and ambitious, Mitchell is also taking a leading role in the development of women's football in Scotland. 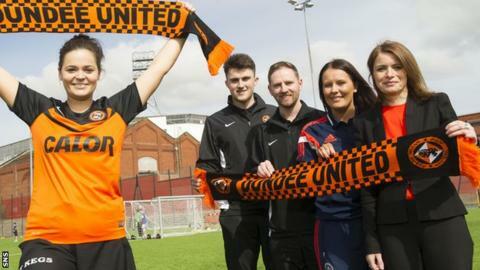 She established Dundee United's women's team - which will compete for the first time next season - and has just joined the Scottish Women's Football board as a non-executive director. She has encountered the entrenched chauvinism of football, but also seen enough changes in the game to be optimistic about women taking more of a role in every aspect of the game, and on merit. "It's a massively male-dominated world. Only recently I was chatting away with somebody in the football world, talking tactics for quite some time, and he looked at me, smiled and said, 'gosh, you really know what you're talking about, don't you?' Through gritted teeth I said, 'yes I do'," she says. "To start with, there were a couple of clubs that I would walk into with my male directors and the other directors would come over and shake hands with all my fellow directors and totally ignore me. "That irritated. But I've worked hard to build up relationships and I think I've built up respect. Women in boardrooms at any level bring a different perspective. We look at things differently. We might arrive at the same conclusion as a man, but we'll do it in a different way. "It's definitely changing. The attitude that there is now when I go into other boardrooms is great. I do think there's still a lot of work to be done. Women's football is the fastest growing sport in the world now, but we have to get in at the grassroots level with girls in schools. "It is important for the game and both the SFA and the SPFL want women at that level and it will happen. Look at Ann Budge - she has turned [Hearts] around and she has very different ideas from a lot of people. So far, she's been very successful." Mitchell believes new boss Mixu Paatelainen is "the right man" to turn United's form around and she is revelling in the demands of being involved in football, however time-consuming. Occasionally, the game prompts moments of pain, and she can still recall the feeling of loss that gripped her amidst the euphoria of United fans celebrating the 2010 Scottish Cup final win. Like so much of her story, that is bound up in her relationship with her father. At the 2008 League Cup final, Eddie Thompson managed to attend the game at Hampden between United and Rangers despite only leaving hospital two weeks before, following a bout of pneumonia. A picture exists of him, frail but determined as he punches the air. United lost, though, which remains a regret for the family. So what would her father think of her involvement in the Tannadice boardroom now? "He'd be chuffed to bits," she says.